One moment you're performing a hypnotic floor routine, the next, you're somersaulting down the runway. TeamGym takes skills from other types of gymnastics and adds a team element, so you can train and perform right alongside your mates. So Lewis, why should the audience watch the TeamGym competitions during the Championship Series? For me TeamGym is great to watch because of the adrenaline rush it can give watching skilfully trained athletes push their bodies in an attempt to outdo other teams. Also because across the three apparatus, each ream needs to maintain a constant level of good point scoring in order to be high on the score board. Some can be better on a piece than others, but all it takes is for a few mistakes here and there with the deductions adding up for that lead to be lost. TeamGym is more of a display style of gymnastics with what is called “streaming” on the tumble and trampette/vault which involves gymnasts performing their skills after one another really quickly. The concept is to demonstrate to the judges and audience the combination of neatness and difficulty on all pieces. It is always exciting to see what each team puts out in competition skill wise at each event how their gymnasts are progressing from event to event throughout the year. What should people be looking out for/ what makes a great routine? The floor routine is performed by the whole team and the aim is to hit as much of the judging criteria as possible with high valued elements being performed. Each of the elements has to be performed by all the gymnasts at the same time. Tumble and trampette/vault is performed by the six strongest scoring gymnasts skill wise in each of the three runs performed on each piece. The first run is called the team round and all gymnasts perform the same skills. After that there can be intensification with the highest scoring skills performed at the end of the stream of six Gymnasts. If every gymnast did the same skill for all three runs there wouldn't be a problem, although generally there will be gymnasts capable of higher scoring skills therefore the scoring for that round will increase and tactically is the better option. With a team comprising of a minimum of six gymnasts and a maximum of 12 at the British Championship, most of the team will be in more than one run and therefore yoy need to train evenly as a gymnast to be a jack of all trades. Why is TeamGym so special to you? Why do you love it? TeamGym has given me a pathway into a healthy lifestyle along with a job and self-worth through the teaching that I do as well as competing as a gymnast. 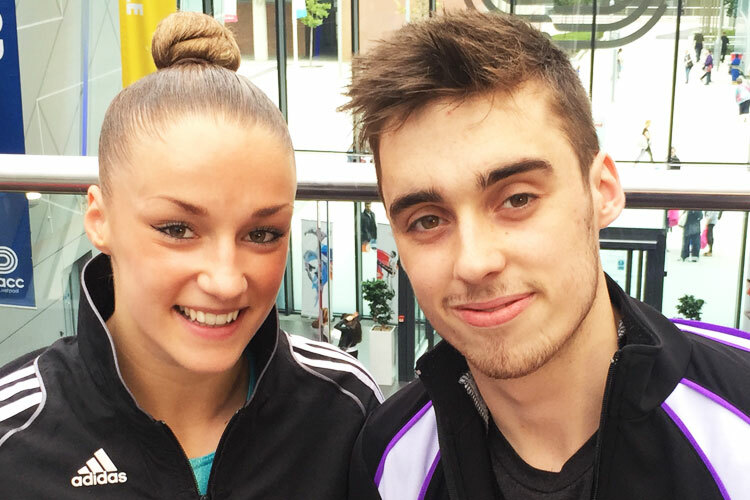 What does it take to be a top TeamGym gymnast? It takes discipline, motivation, passion and the enjoyment of being part of a bigger community and helping your team mates succeed in order to create a stronger team. TeamGym is not an individual discipline and the beauty of that is that not everyone has to be the best, but a good personal standard can be achieved and will go a long way to being an asset to a team. I am 25 years old this year and I started TeamGym around 16/17. I know of older gymnasts who have inspired me and they are still competing, we see gymnasts competing into their 30's at European level. How excited are you to compete at Echo Arena in Liverpool this year? Having the Echo Arena as a new venue will be exciting as personally I have never been and I am hoping the atmosphere of the audience and other teams will drive us to be the best we can be on the day. On another personal note, it is very exciting having the opportunity to compete again at the National Finals for TeamGym as it is the highest level in this country for our discipline. Chekc out the British Gymnastics Championship Series event page.